What is my compulsive need to check my phone all the time? Why do I pick up my phone to see if I have any text messages? Once I have my phone in my hand why do I check Facebook? And then why do I need to check my e-mail, and then the weather? What am I looking for? 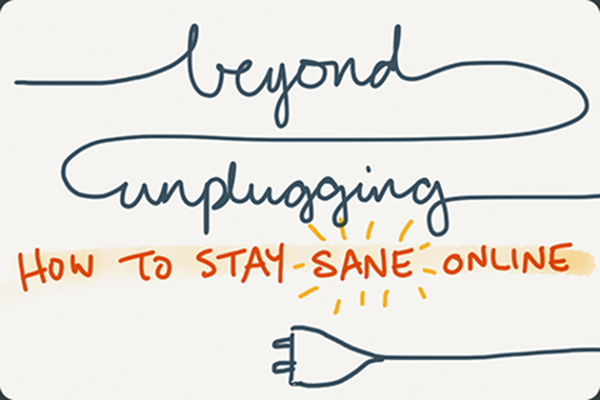 It’s a question I find myself asking myself quite a bit since I started this process of attending to my technology use and attempting to mindfully unplug. Larry Rosen in iDisorder asks these very questions, “Are you a compulsive technology user? Are you constantly checking your e-mail, your text messages, or your voice mail? If so, you’re not alone” (54). Phew! That’s a relief, or is it? It’s still a problem for me. Rosen goes on to talk about two types of compulsive behaviors around technology. The Addict and the Worrier. An addict could be described as someone who “loves their device, craves surfing the Internet, and loves their software and phone apps so much that they cannot get enough of them” (48). The Worrier is “so worried about missing out on some important news that they can’t keep themselves away from the Internet or their phones” (48). It’s hard for me to say whether I’m an addict or a worrier, or perhaps both. What I truly think I’m looking for when I pick up the phone or check my e-mail is connection. I want to feel connected to a person, a community, or a passion like yoga. It does not negate the fact that I don’t want to be this compulsive around technology, the Internet or my phone anymore. Through my research, I’ve found some very helpful suggestions, and the one I’m going to elaborate on today is the Tech Break. These Tech Breaks can be implemented by anyone in any setting such as in a workspace, a classroom, and a family dinner. The goal is to spend 15 minutes of time disconnected from your digital devices and social media. After 15 minutes one can spend a minute checking their device before instituting another 15 minute focused time period without technology. I did this yesterday, and the results were astounding to me. I arrived at my workspace at 12:02. When I pulled out my computer to conduct my research, I noticed that I had 2% battery left and no power cord. Fortunately I had print outs of several articles as well as iDisorder in paperback form. It was an excellent time to test out the Tech Break scenario with my iPhone. In many ways writing margin notes and taking notes in a notebook felt archaic to me, but my focus was undeniable. I worked steadily for 40 minutes before checking my phone. With no Internet to go to when another researcher, URL or study was mentioned, I stayed on the task of taking notes on the actual article I was reading. It was then that I realized how many times I go off task by checking another website since I rarely come directly back to the task at hand without meandering through a few other sites including Facebook or email. I equate this realization yesterday with the same type of awareness one has when we experience the present moment. Once you’ve experienced it, it’s very hard to go back to your ignorance of the fact. We can intentionally choose to live in the past and the future, just as we can intentionally choose to check our technology compulsively… or can we? Is awareness enough with this seductively addictive media.